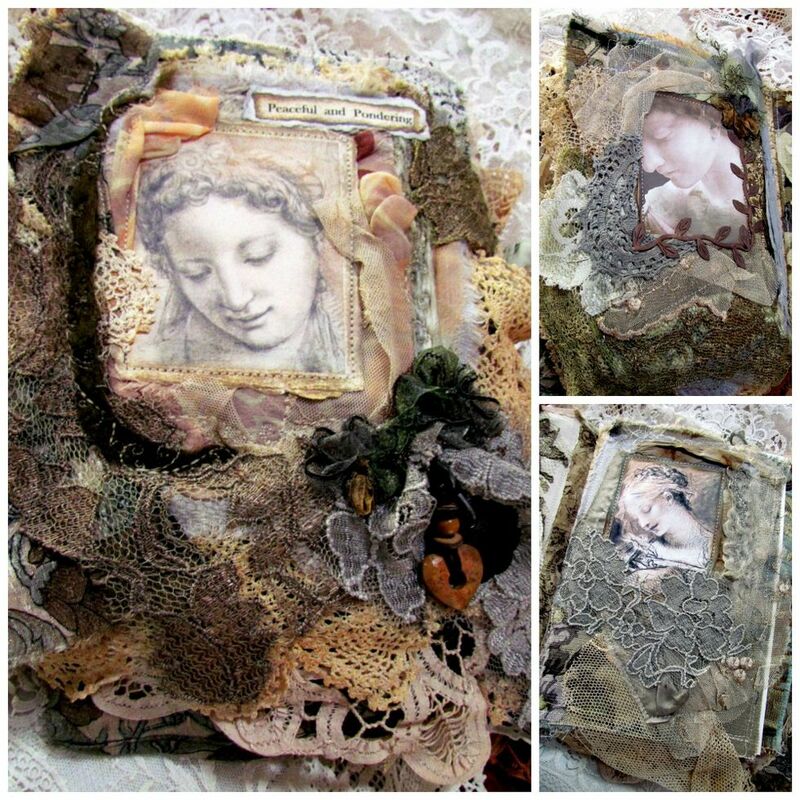 I love your teacup and collage! Beautiful. 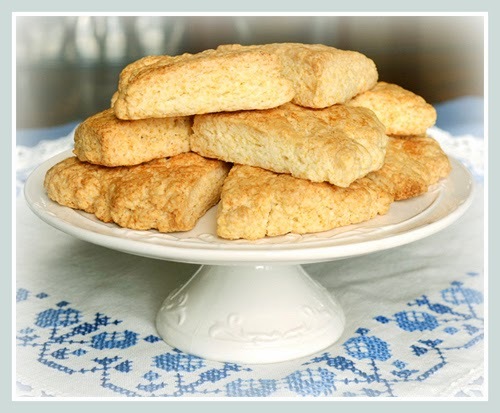 I'm making some scones tomorrow, and yours look so inviting! 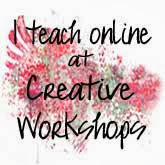 Thanks so much for linking to Tuesday Cuppa Tea and have a wonderful week! When I viewed your first photo of the cup and saucer I knew it was Coalport. 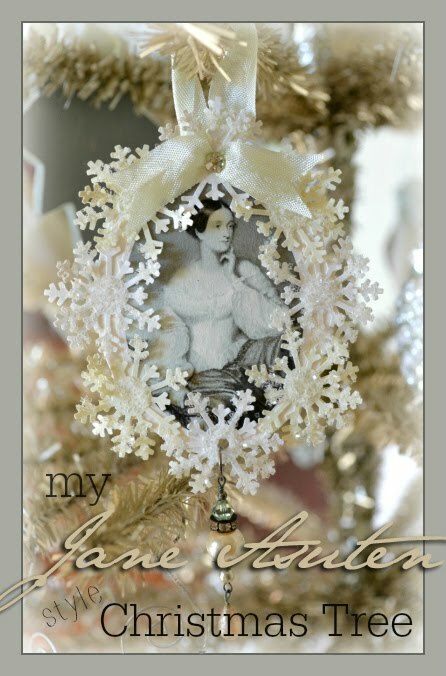 I know the shape and is one of my favorite shapes next to Shelley dainty shape. I forgot the name of this pattern until you wrote it. I love this pattern and I believe it also comes in red. Thanks for sharing this charming cup and saucer and I was out shopping and found the pattern Vintage Charm by Johnson Bros. with a blue bird and bought the set. I really love bird sets! Have a delightful week! This tea cup is wonderful. I love blue English or chinese dishes. All mine is blue, coming from England, with some vintage chinese pièces and some old french plates, not exactly the same blue, but I like to mix them on a table! 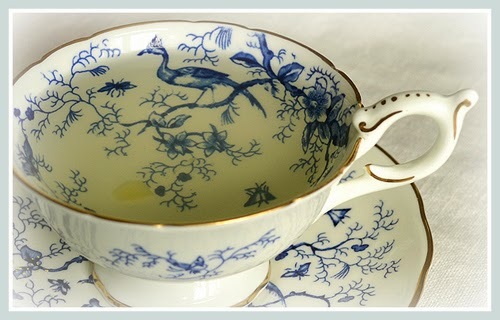 I love this tea cup for its color and above all, its picture of bird! I have a red one of the same pattern and I love it. The blue is beautiful , my favorite color. I wonder how many color variations there are of this teacup ? Have a very happy birthday Terri and thank-you again for hosting this lovely celebration of all things tea ! 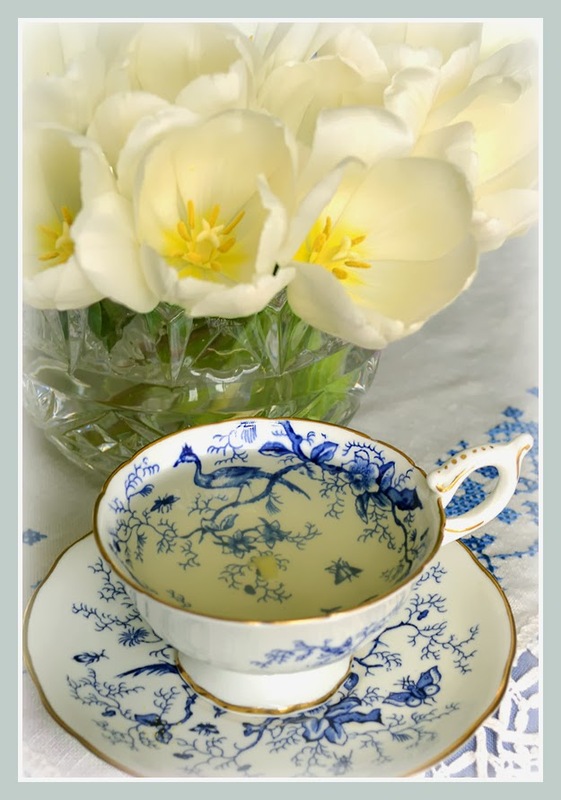 Your teacup is so very pretty and just perfect for the Birdie Tea. 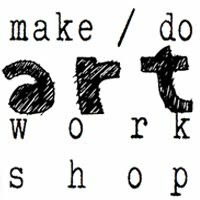 Thank you for hosting and have a great week. 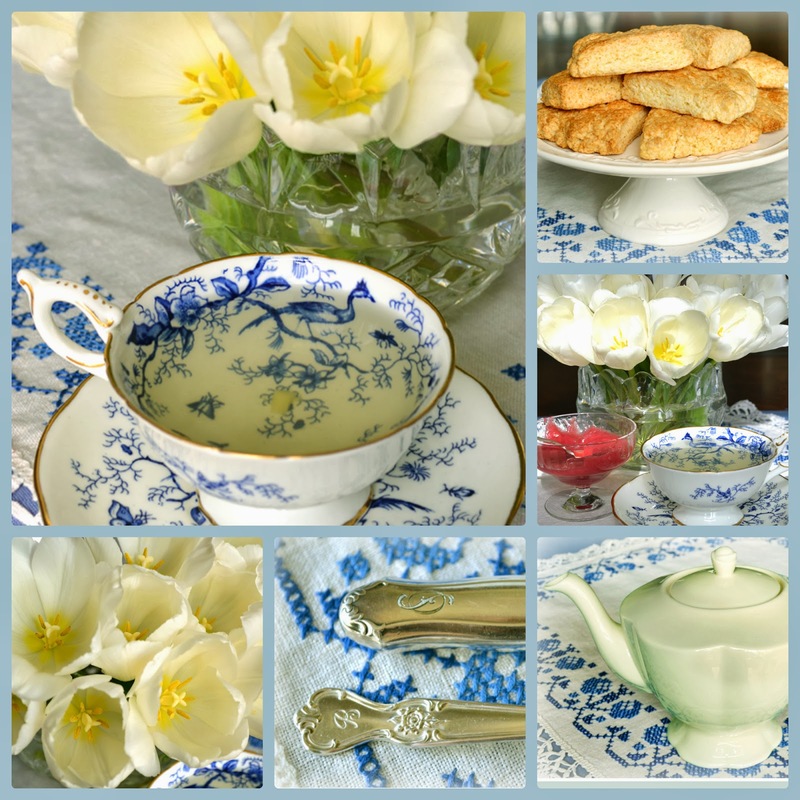 The blue and white cup has a delicate pattern and your scones look yummy. I've pinned the rhubarb jam too! I cannot link this week, keep getting an error page. 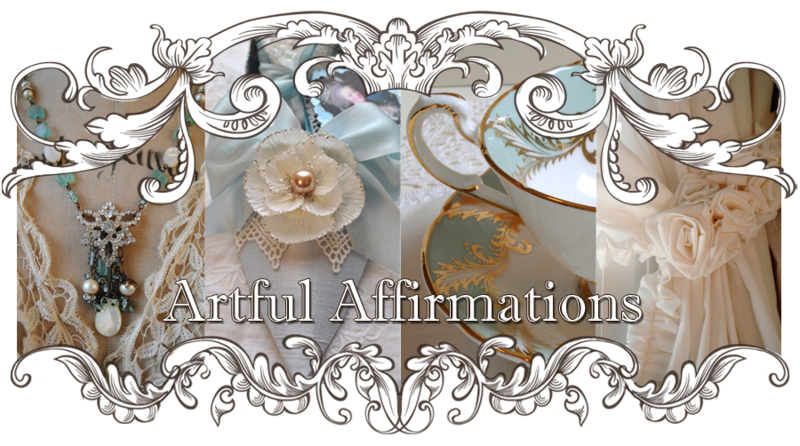 I love the intricate painting of your birdie teacup and your table setting for tea and scones looks just divine!! 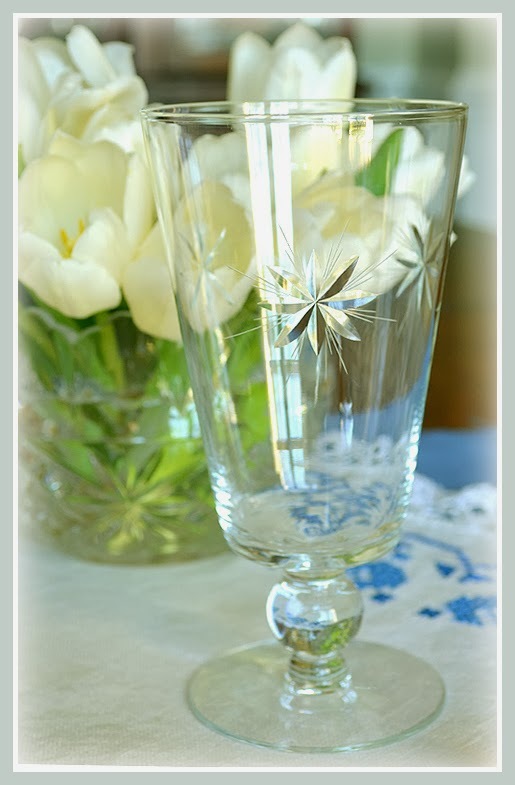 I love that vintage water glass. Wishing you a very happy , happy birthday my friend. Enjoy your time away! Your tea cup is so lovely! The ginger tea looks so yummy in it. Your flatware is also so elegant. Wish I was aharing a scone with you! What a lovely tea table, Terri! The scones look wonderful and the jam, well, I love rhubarb! I saw that same teacup only in red at one of my favourite antique shops, but it was way out of my price range. I have longed for it but even when they offered it to me at a third off, it was still too pricy. I don't usually pay over twenty-five for a teacup and this one was close to seventy. Yours is a real treasure and I love it! Thank you for sharing and joining me for my special Bird Lover's Tea. We will miss you next week and I wish you the Happiest of Birthdays, my friend! I love the beautiful light and airy pattern of this and the mixture of blue and white. So pretty...and your spread looks so yummy! We have had wonderful temps here in Michigan that past two days - it hit 51 yesterday. My eczema has been happy for two days and so has my soul! :) Big hugs and Happy CHEWSday to you! Sending you early Happy Birthday Wishes to you here. May your birthday filled with joy. I discover that I only have one bird tea cup, I always having doubt when it comes to having a bird print inside the cup. 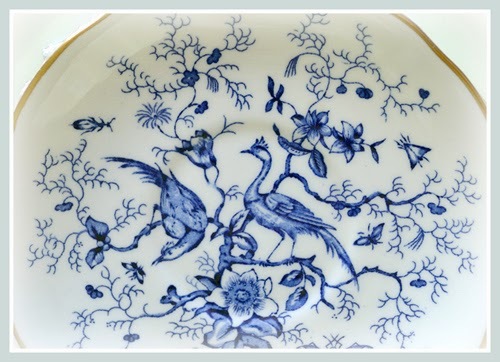 But the bird print reminds people of the birds of paradise, it is a nice print to have on porcelain or china. Again all the best wishes to you. Hi Terri, beautiful birdie post. The cup and saucer are elegant and against the embroidered linens and your new to you crystal -- just stunning. I'll have to check out the scone mixes. Have a good time while you are away. Happy Tea Day! you created a beautiful table setting, with your lovely blue patterned cup, on the table cloth matching wonderfully, and with the old cutlery and glasses. UHMMM we say here,--for something tasting good, and your scones looks very tasty with the homemade rhubarb marmelade. 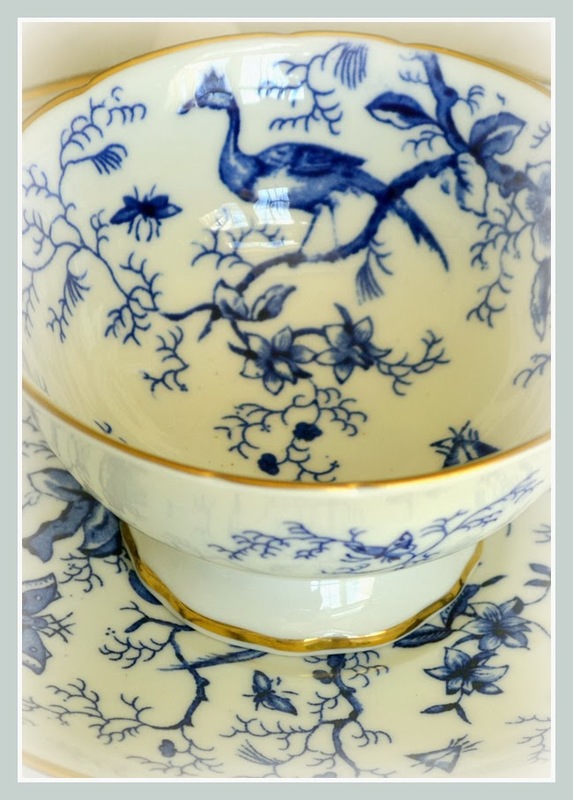 Lovely Blue Bird teacup! Enjoy your birthday next week! what a beautiful tea cup! I've never seen any like it. Perfect for Sandi's tea! 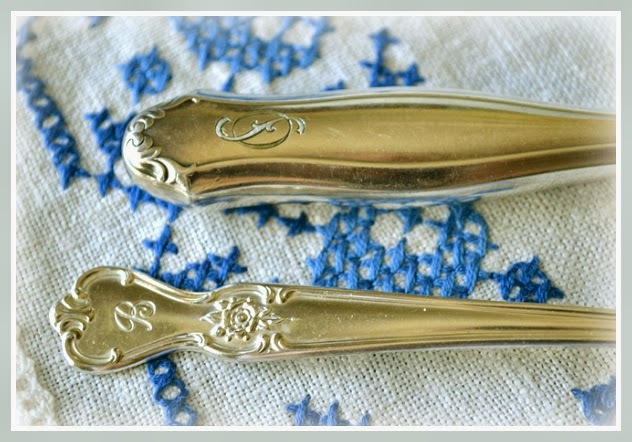 love your vintage silver, and the scones look delicious. Have a happy birthday! the teacup you showed us is so chic! and de the scones with the jam .... yummmmm ..... I love rhubarbjam, I make it every year. I also love the beautiful white tulips, springtime!I wish you a lovely week and thank you for coming on my blog and your nice coms all the time! Hugs from France! What a delightful vintage setting with your gifted sister's cup and saucer! The bird, bees, berries and trees and simply gorgeous in delicate blue and white. That rhubard jam looks wonderful. I think we should have a go at that sometime! We have a lot growing in the garden. Well sweet friend Wishing you Very Big Birthday hugs and some love too. You have the prettiest cups Terri. And this one is no exception. Happy birthday to you. Have a wonderful week. What a beautiful teacup! 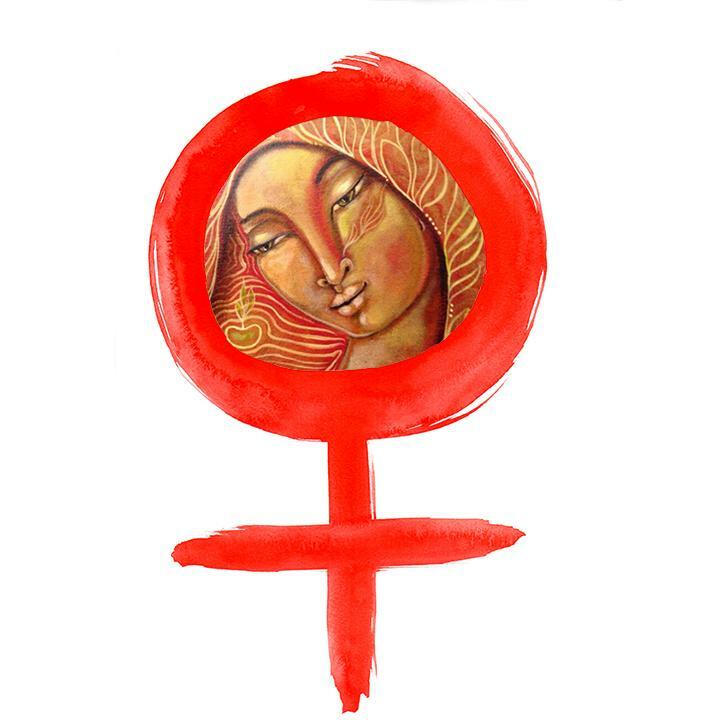 Have a wonderful birthday and thank you for hosting! Beautiful teacup! I have two Polish teacups with birds I love too. I also love your pretty new picture Terri. Happy birthday a Little sooner, you can start celebrating my friend. Thank you so much for having us at your lovely tea party. Terri that cup is beautiful! It is a unique beauty! I am going to have to try ginger tea. You have me curious. I always look forward to your posts. What a beautiful Coalport tea cup (you gotta love Coalport), and those scones look yummy. 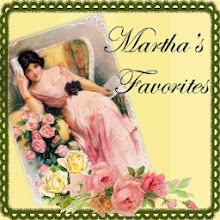 Thanks also for "introducing" me to Rose Chintz Cottage -- another lovely blog to enjoy over a hot cup of tea. Looks like such a beautiful teaparty! That is a very sweet cup! 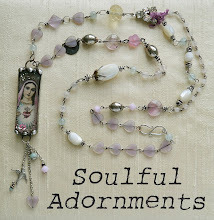 Blessings for the week to come. Yes - I do remember this cup, Terri. The only time I've ever heard of one with a CRICKET in the pattern. The birds are delightful in all their blue and white splendor! I have ginger essential oil and may add a drop to my green tea this afternoon - your new favorite has me wondering if it might be a new favorite for me, too. Must try that gf scone mix - always on the lookout for the next best scone. So glad you shared your birds this week - have a lovely time next week, though you'll be missed. Your tea cup this week is really beautiful.I love it! Now I haven´t got enough time for making a tea cup post every tuesday but I hope I wiil be able to do it soon. Blue and white always looks so fresh doesn't it and the nature design is gorgeous. I enjoyed your tea-time very much. Happy Birthday to you. hello Terri, so long since i had stopped by. with all the changes: instagram and facebook and flickr is where i post most of late but bloglandia is still my favorite to get the full picture. 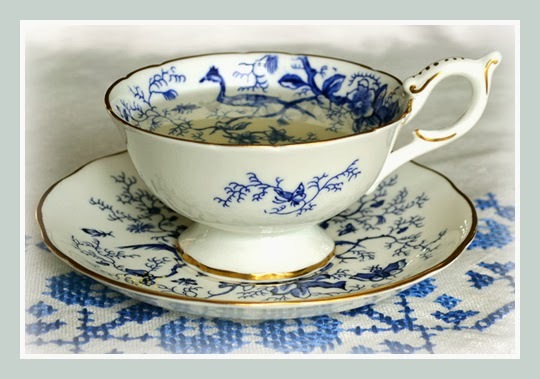 love that blue cross stitch tablecloth you used for the prop of your teacup tuesday. Oh my gosh! The blue, the birds, the crosstitch, ginger tea, and your birthday, it couldn't be better!!! Oh, scones and jam too!! Hope you had the happiest birthday, love you! Happy belated Birthday to you. I hope you had a wonderful celebration. Your tea time is so lovely. Thank you for sharing. What a lovely tea setting with that gorgeous teacup and delicious food. Thank you for hosting for us today. Happy St. Pat's Day! I was in a thrift store one day and saw this tea pot. I thought my daughter would love! 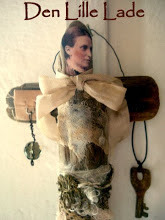 She bought a new house and is putting touches of antiques around the home. So I got home with my fine Coalport teapot and tried to find the creamer and sugar bowl on line. So I called this company and she said she sold the teapot I have last yr for 575, I said $5.75 she said no $575.00. I almost lost my breath on the phone. I paid $7.00 for it. Well my daughter insists I keep it in my china hutch. 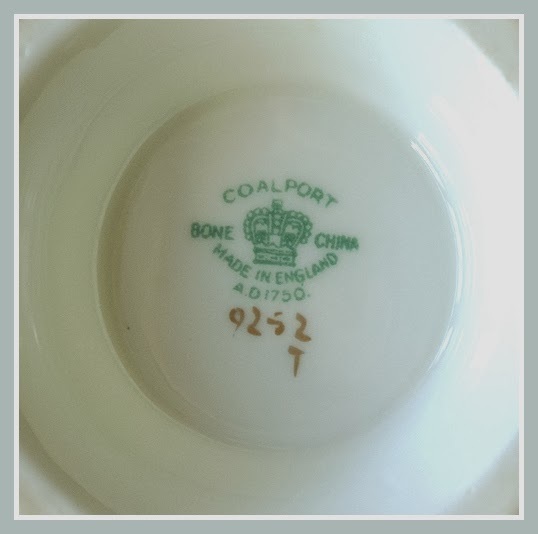 So there it is :) Your coalport tea cup could be priceless! 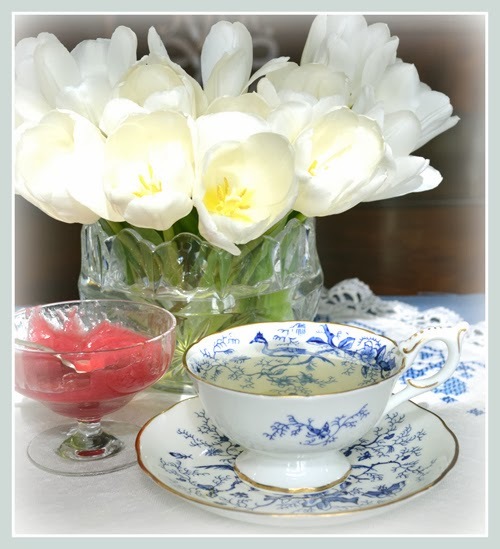 Hello Kindred..wow..what a beautifully-delicate and elegant photo-series...the tea cup is truly special ..and the soft gentle flowers and table settings and treasures..wonderful! 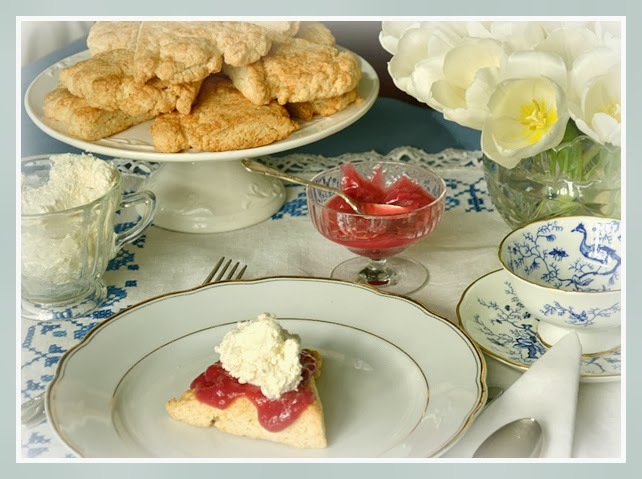 Those scones look divine..yay, I love that site too..great recipe..the jam looks gorgeous! Wishing you a most magical Spring! PS: Birthday Blessings!! wishing you mega-sparkles all around you..all year long!